Over 374 trillion sticks of gum are manufactured each year. 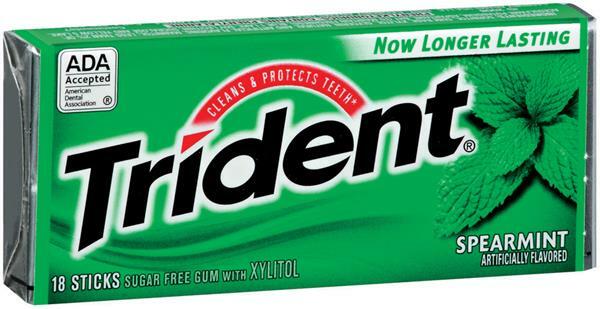 The average person chews over 300 sticks of gum each year (chewinggumfacts.com). following meals can help reduce plaque formation and help prevent tooth decay. 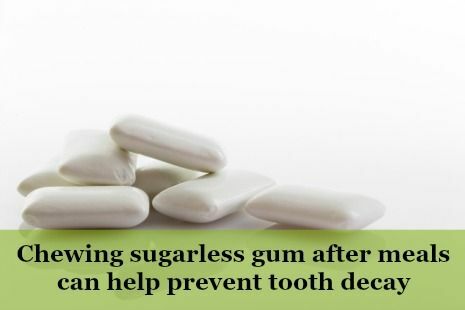 Research shows that chewing sugarless gum for 20 minutes following meals can help prevent tooth decay. 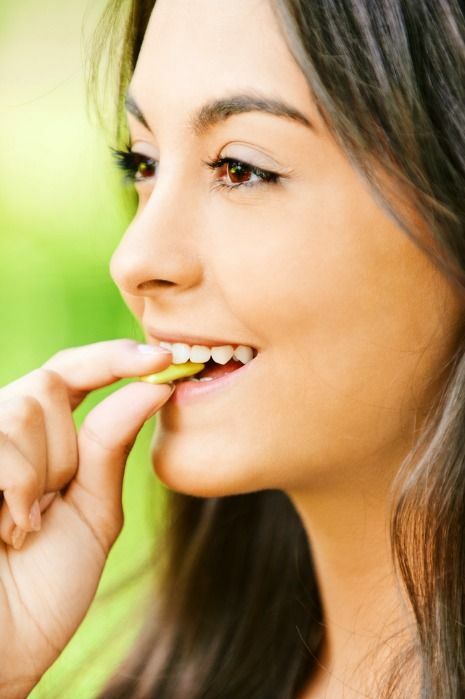 The mere act of chewing increases your mouth’s saliva flow which helps to neutralize and reduce cavity causing acids and bacterial dental plaque. Overtime, acids from foods and beverages can erode and demineralize tooth enamel, outermost layer of tooth. Frequent and extended exposures to acid increases your risk for tooth decay. Increases amount and flow of saliva secreted by salivary glands. Chewing gum for 20 minutes following meals and/or beverage consumption helps to neutralize your mouth’s pH. A pH below 5.5 increases your risk of developing dental caries. Research suggests that rhythmic motion of chewing gum helps reduce stress, nervousness, and tension. Sugarless gum is a low calorie alternative to a high calorie snack or beverage. Chewing gum much longer than the recommended 20 minutes can aggravate jaw and facial muscles and lead to symptoms of TMJ, tempromandibular joint disorder. TMJ symptoms often noted include: muscle spasms, tension headaches, soreness chewing desired foods, jaw ache, problems opening and/or closing teeth together. Chewing gum contains ingredients that can cause gastrointestinal discomfort and/or bloating. Sugarless gums often contain artificial sweeteners like Xylitol, Sorbitol, and Mannitol, all of which can have an undesirable, laxative effect. Chewing gum with Xylitol. Is it better? Xylitol, is a sugar alcohol (artificial sugar substitute) derived primarily from forest and agricultural materials like corn cobs. Early studies conducted by the Council on Clinical Affairs (2006) indicated that “sugar alcohols were not readily metabolized by oral bacteria”. This indicated that Xylitol when added to oral care products is a viable, non-cariogenic sugar substitute and helps to prevent tooth decay better than sugarless gum not containing Xylitol. Since 2006, there has been ongoing discussion about Xylitol’s benefit claims among the dental research community. Ongoing research lacks consistent evidence to claim that sugarless gum with Xyltiol is superior to sugarless gum without Xylitol. As a result, the American Academy of Pediatric Dentistry updated its oral health policy statement published in the Journal of Pediatric Dentistry in 2015. Ranging from 4-15 grams/per day and between 3-7 consumption periods. Note: Keep in mind the potential laxative effect associated with high intake and usage of sugar alcohol containing products. Chew sugarless gum following meals for approximately 20 minutes. Brush teeth 2X each day, floss once daily. You can elect to use Xylitol containing products so long as you avoid any undesirable side effects. If your dentist feels that you are at high risk for dental caries, he/she may elect to prescribe a daily topical fluoride. Maintain preventive dental visits every six months or as recommended by your dentist. Call (763) 586-9988 to schedule a dental appointment today or click the button below to request an appointment.